My goal in life is very simple. I want to promote freedom and prosperity by limiting the size and scope of government. That seems like a foolish and impossible mission, perhaps best suited for Don Quixote. After all, what hope is there of overcoming the politicians, interest groups, bureaucrats, and lobbyists who benefit from bigger government? But I don’t think I’m being totally irrational. I’ve pointed out, for instance, that we can make progress if we simply restrain the growth of government so that it expands slower than the private sector. Surely that’s not asking too much, right? Heck, we’ve done that for the past two years! Moreover, while much of Washington is a fact-free zone, I’m encouraged by the wealth of evidence showing that big government is bad for growth. I’ve cited research on the negative impact of excessive government spending from international bureaucracies such as the Organization for Economic Cooperation and Development, International Monetary Fund, World Bank, and European Central Bank. And since most of those organizations lean to the left, these results should be particularly persuasive. I’ve also cited the work of scholars from all over the world, including the United States, Finland, Australia, Sweden, Italy, and the United Kingdom. And I share additional compelling data in this video, including a comparison of the United States and Europe. Now we have some more evidence to add to our collection. Here are some excerpts from a study by two European economists. We’ll start with a blurb from the abstract that tells you everything you need to know. The aim of this paper is to analyze the impact of government spending on the private sector, assessing the existence of crowding-out versus crowding-in effects. Using a panel of 145 countries from 1960 to 2007, the results suggest that government spending produces important crowding-out effects, by negatively affecting both private consumption and investment. But if you want to understand how they did their research, here are some methodological details. While most of the tests of the “crowding-out” versus “crowding-in” hypothesis that have been carried in previous papers focus on a time series or cross-country approach, this work extends such analysis to a panel data set of 145 countries from 1960 to 2007. The results show that government spending produces important crowding-out effects, by negatively affecting both private consumption and investment. …In addition, we analyze possible asymmetries of the effect of government consumption on private consumption and investment. In particular, we test: i) whether the effect varies among regions; and ii) whether it depends on to the phase of the economic cycle. We find that the effect varies substantially among regions, but it does not seem to depend on the phase of the economic cycle. …we study the impact of changes in the ratio of government spending to GDP on the growth of real per capita private consumption and private investment. Here are some of the key results, starting with how government spending impacts consumption. Starting with the analysis of the effect of government consumption on private consumption (Table 5a), we can immediately see that it is negative and statistically significant. The results also suggest that not only contemporaneous changes in the government consumption-GDP ratio matter, but also its past lags (specifically, the 2nd and 3rd ones). In particular, the cumulative effect of government spending on private consumption is about 1.9 %, of which about 1.2% captured by contemporaneous changes in the government consumption-GDP ratio and 0.7 % by its lags. This result can be interpreted as follows: an increase of government consumption by 1 % of real GDP immediately reduces consumption by approximately 1.2%, with the decline continuing for about four years when the cumulative decrease in consumption has reached approximately 1.9 %. And here’s the data on how government spending affects investment. Similarly to what we obtained for private consumption, both current and lagged changes in government consumption-GDP ratio have a negative and significant effect on private investment, with a cumulative effect of approximately 1.8%. The main difference between the effect on consumption and investment is that, while contemporaneous change in the government consumption-GDP ratio seems to have a bigger effect on consumption, lagged changes are more detrimental for investment. Interestingly, the economists find that the harmful impact of government spending varies by region and country. But is the effect similar for different regions and countries? To answer this question, we replicate the estimations for specific geographical areas and countries. …The results show that the effect varies substantially between areas. In particular, while we find statistically significant crowding-out effects in Africa, Europe and South America, government spending does not seem to have (statically) significant affects in the other areas considered. We also assess whether the effect is different between developed (OECD) and developing countries. The results suggest that the impact of government spending on both private consumption and investment is more detrimental in the OECD group. …it emerges that the “crowding-out” effects of government consumption are largest in relatively less developed countries (such as Mexico and Turkey) and in those countries with a high share of government spending (such as Finland, Sweden and Norway). While I’m always cautious about drawing sweeping conclusions from any single piece of empirical research, these results make a lot of sense. 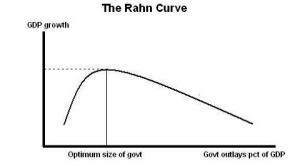 The Rahn Curve (which is sort of a spending version of the Laffer Curve) is based on the theory that a very modest level of government, focusing on providing core public goods, is associated with better economic performance. But once government gets too big, than the relationship is reversed and higher levels of spending are associated with weaker performance. So it’s no surprise that bigger government has particularly bad effects in nations that already have bloated public sectors. Here’s the video I narrated on the Rahn Curve, which provides additional analysis. Last but not least, it also makes sense that bigger government has a pronounced negative effect in less-developed nations. Those are countries that generally have serious problems with corruption, cronyism, and the rule of law (i.e., Argentina), so the budget often is simply a tool for transferring funds to those with power and political connections. For all their flaws, the Nordic nations at least are reasonably honest and well run. That being said, the fact that they can endure a larger level of government doesn’t mean it’s a good idea. P.S. Someone did a video attacking my analysis of the Rahn Curve. Except it isn’t really an attack since I agree with the criticism. P.P.S. For those who want to argue that the relative prosperity (by global standards) of Western Europe is evidence that big government is good for growth, I invite you to look at this chart. Simply stated, Western Europe became rich when government was very small. P.P.P.S. Just as there’s lots of evidence about the damaging impact of government spending, there’s also a lot of research showing that high tax rates are economically destructive. P.P.P.P.S. While I sometimes myopically focus on fiscal policy, remember that there are many other policies that determine economic performance. Thanks for continuing to be a voice in the wilderness. Interesting that the lag effect is four years- approximately the same time as our presidential election cycle. But the immediate effect is also larger, meaning that if you put an artificial stimulus” in place, you cannot blame the last president for its immediate effect. One more point- I have always thought the deleterious effect of government spending is obvious. 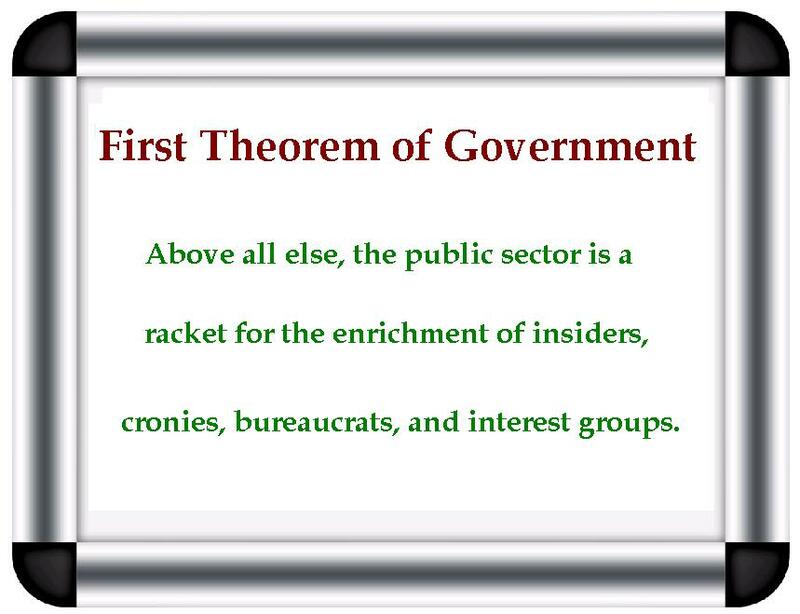 After all, every bureaucrat that government spending goes to hire is targeted to find more and more ways to fine or tax the people. Thus removing even more money from the public coffers, and justifying their position to their masters. “Our democracy means an omnipotent elected assembly. When most of history – most of modern history – was an attempt to limit government. And then there was the unfortunate development that people believed that as long as you gave the power to the representatives of the people – other limitation of government was no longer necessary. So all the long efforts to limit government were swept away and the power given to a single assembly which could both make the laws – which could both make the laws which it wanted for its purpose – and [also] govern. So what we have got is UNLIMITED democracy where the government elected can do what they will. AND WHAT IT WANTS IS BY NO MEANS OBSERVING THE OPINION OF THE MAJORITY. Because the process by which you form a majority is paying-off particular groups with particular benefits. As long as the elected assembly has the power IT MUST DO IT! YOU CANNOT FORM A MAJORITY IN AN ELECTED ASSEMBLY UNLESS YOU USE THE POWER YOU HAVE IN ORDER TO GRANT PARTICULAR BENEFITS TO PARTICULAR GROUPS. http://www.econlib.org/cgi-bin/searchbooks.pl?searchtype=BookSearchPara&pgct=1&sortby=R&searchfield=F&id=10&query=spent+and+wasted&x=7&y=9&andor=and Found in comment on cafehayek.org. (3) The links are invaluable: Few share such wide awareness. Reblogged this on The Story of a Tree Frog. Your goal is admirable, but unfortunately it’s a waste of time. The reason is simple – govt has never acted proactively to reduce its own power and perks, and it won’t start now. The change you and I desire comes only through the market/invisible hand, which means we will have to crash and burn before meaningful reform occurs. The best we can do is prepare the folks for what is to come and make sure as many people as possible will not grab for the govt/Fascist life boat that promises to make all their discomfort vanish. The folks at Twisted (http://twistedlittlethings.com/tlt/) are behind you. I like the links. They allow me to dig deeper when a topic interests me. As much as I enjoy reading your posts, your need to drive traffic by linking to prior posts, is overwhelming the points you make each day, not supporting them. Everyone I forward the daily emails to tells me the same thing..too many links = diversions. They rarely finish the email, and some have stopped reading because it looked like you were just link-spamming your own site.